…that this month I wrote the least amount of blog posts ever. …that I haven’t written an It’s Okay post in a month. …that now that all 3 of my kids start school before 8 AM, I can go to the gym in the morning. And go to two classes in a row. But I told Dave I’d need to work out all day non-stop if there would be any hope of losing weight. …that Simon got Minion Bob for his birthday and I think it’s really cute. …that I have so much to share from our Israel trip that you might just get bored of reading all about it! 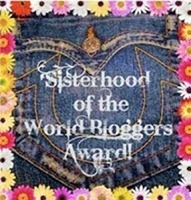 …that MilitaryWife & PugLife tagged me for the “Sisterhood of the World Bloggers Award.” She gave me 10 questions to answer and I’m going to answer them right here! Those weird, one piece jumper outfit things. Tortilla Chips. Because I eat them a lot. There is only one person I can think of and she’s not that famous…Bellamy Young. A present. I’d share a picture but I don’t feel like dealing with my scanner. 7) What is the stupidest excuse you’ve ever used to get out doing something? And did it work? Probably just that I didn’t feel like it. Yes. I don’t remember. I have definitely re-swapped some things I received in blogger swaps though.